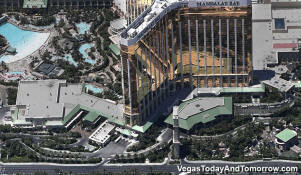 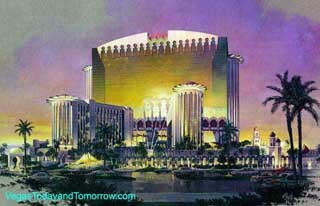 The original rendering of the Mandalay Bay, shows a separate building for the Four Seasons (which now occupies the top-most floors of the Mandalay Bay building). 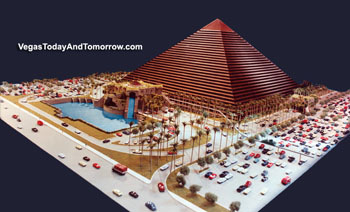 The tower is a bit skewed from what was built and the "themed" area (in the foreground) was moved to the other corner (close to the Luxor) and replaced with the Four Seasons lobby. 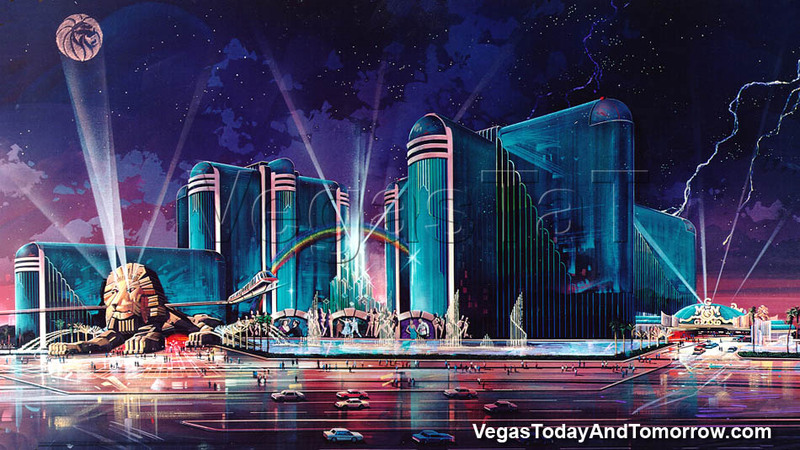 The original rendering for the MGM Grand was a real OZtravaganza. 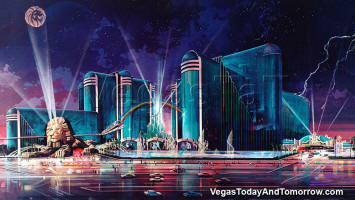 Rainbows, OZ-esque architecture, dancing fountains, monorails, and an MGM bat-signal - Glitter and Sparkle and Glitz - Oh my. 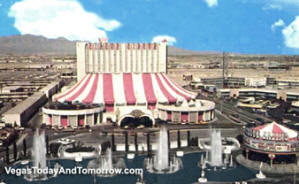 I'm glad they toned it down. 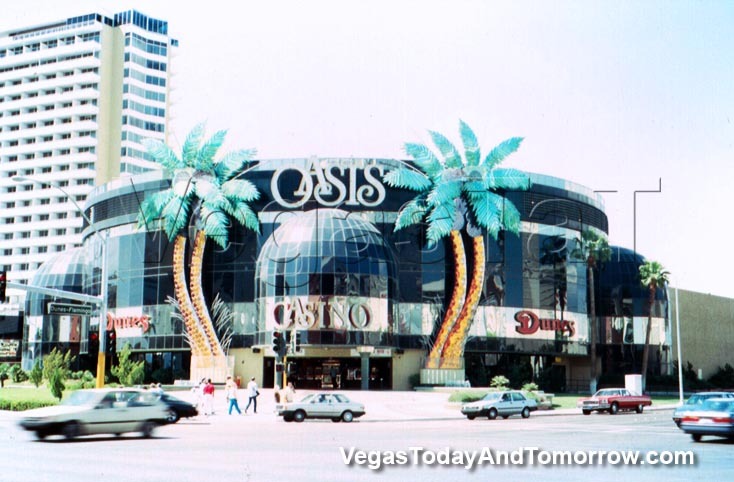 In the early 80's, the Dunes had plans for an expanded casino and a new rooms-tower. 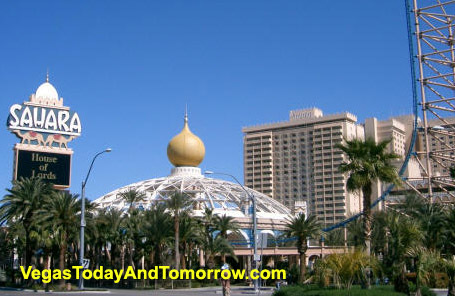 The original Diamond of the Dunes tower was to be re-skinned in glass with a matching taller tower on Flamingo. A pyramid-shaped casino was proposed for the corner (I wonder from where the idea for Luxor came). 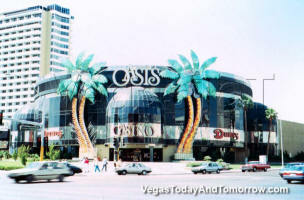 The Oasis (right) is what was built. 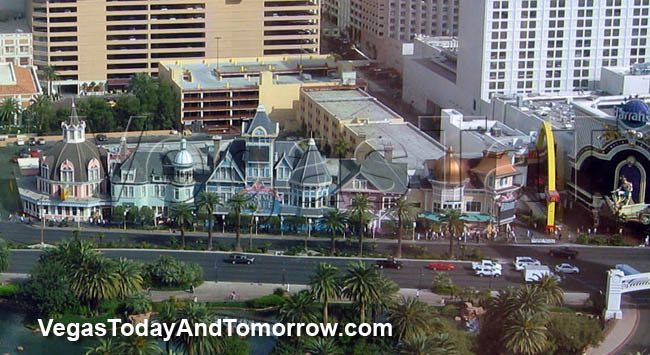 The only notable differences between the Casino Royale rendering and the finished product are: Denny's does not have alfresco dining, the sidewalk isn't nearly that wide, and the casino is not as open and inviting. 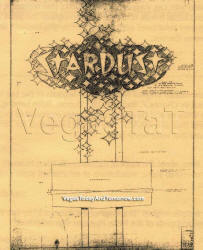 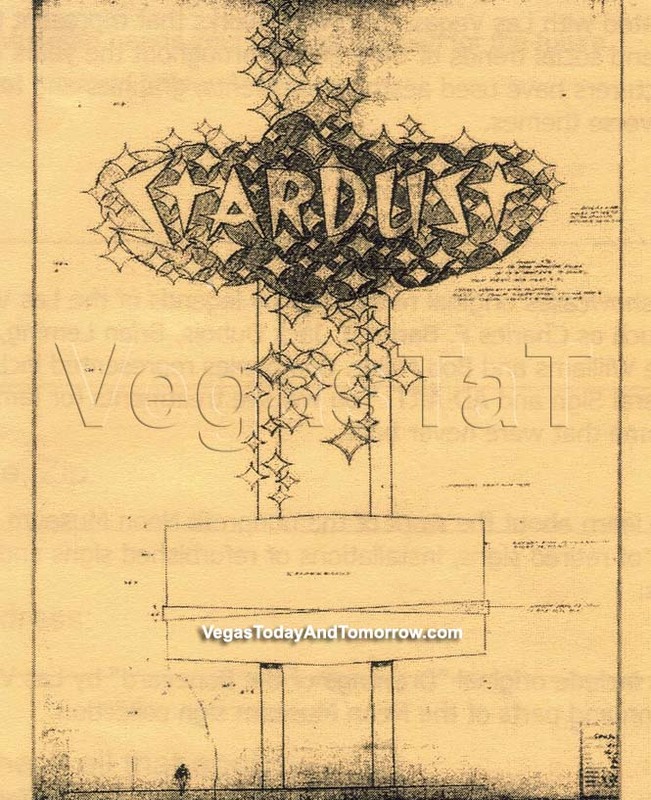 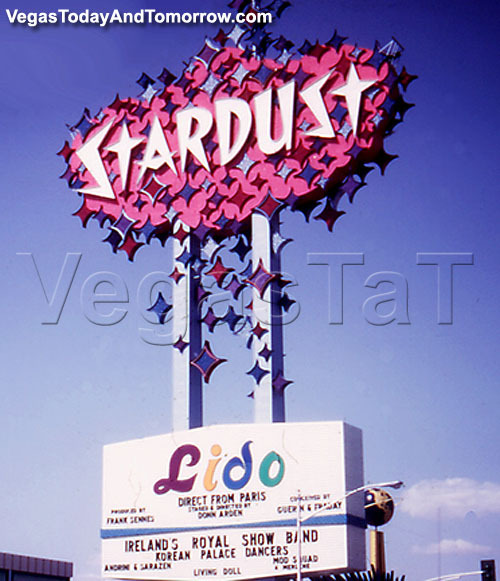 The original pencil drawing of the Stardust sign was very close to what was actually built. 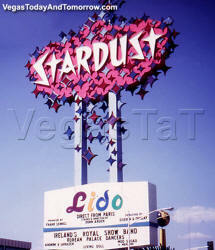 Since the implosion of the Stardust, the sign has been dismantled and is safe and sound at the Neon Graveyard. 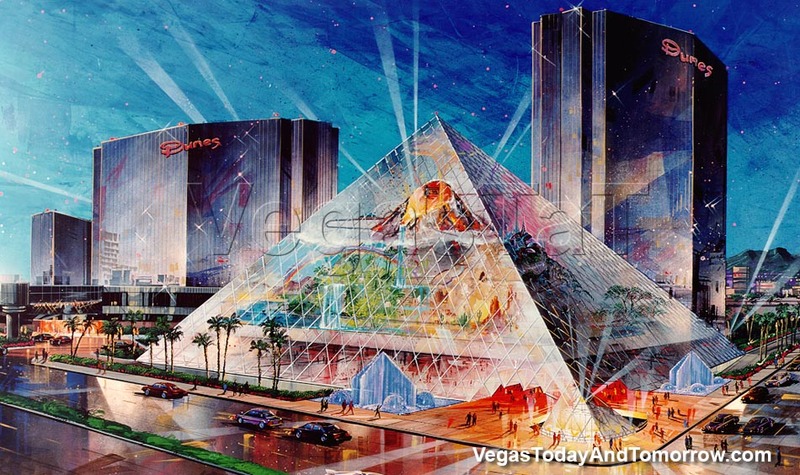 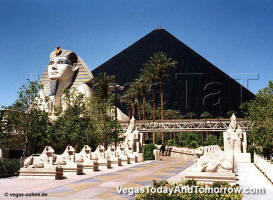 The original concept of the Luxor had no Sphinx, no light on top and a striped facia. 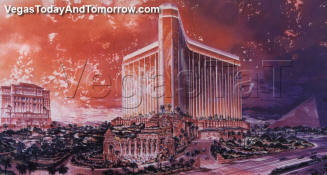 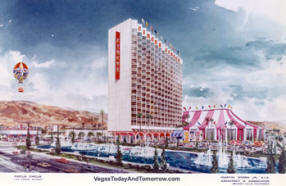 The original concept for the first hotel tower at Circus Circus, shows the tower out front, close to the strip. 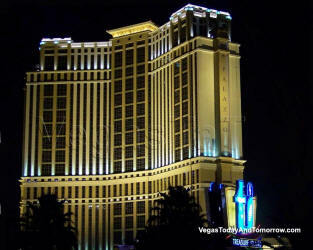 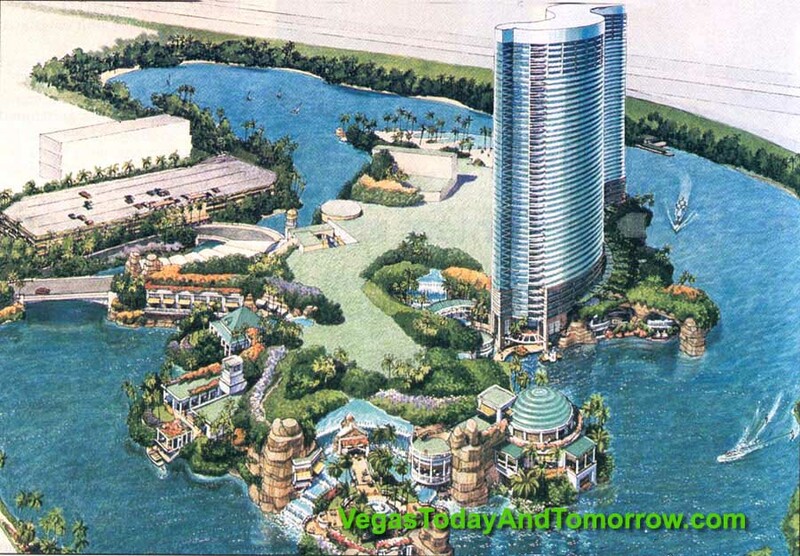 The new plans relocated the tower to the back of the casino. 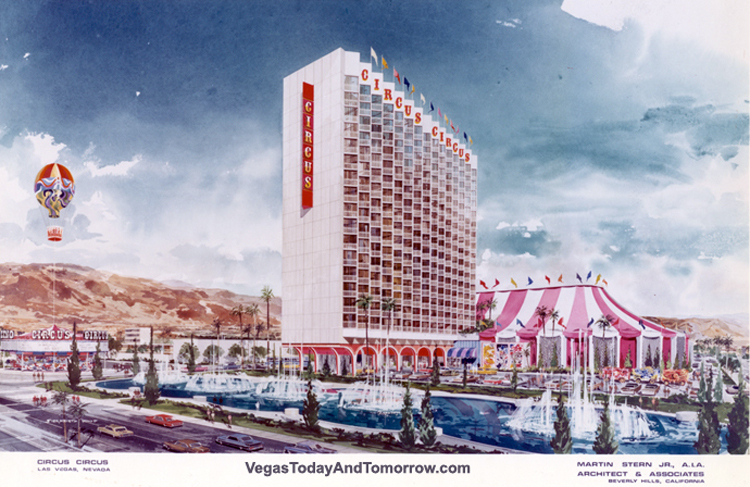 The tower opened in 1972. 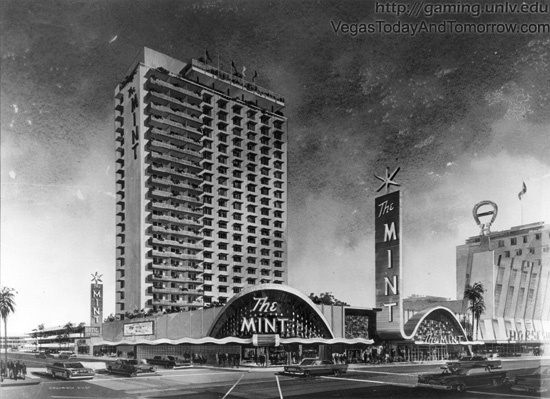 The original 1965 rendering of the rooms-tower for The Mint (now Binion's), is quite a bit different than the completed tower. 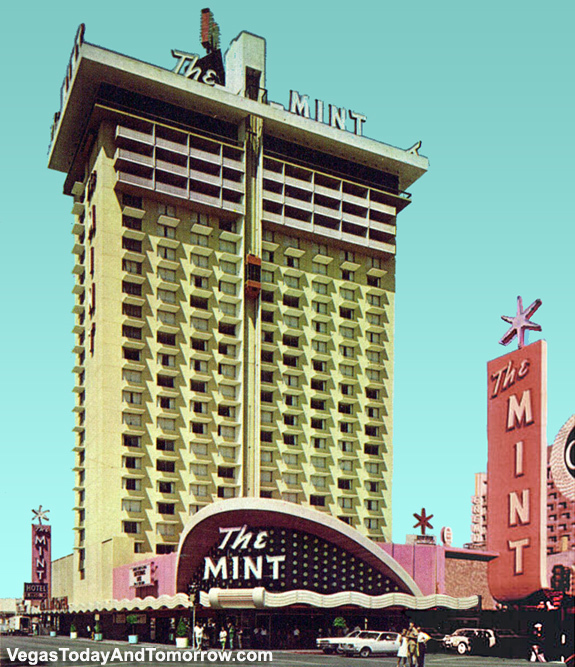 The tower lost some style and gained an outside glass elevator and a rooftop pool. 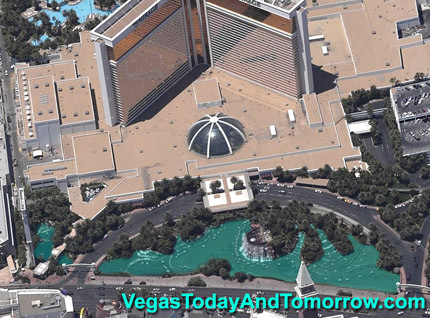 The rendering shows trees on the roof of the casino building suggesting a pool area. 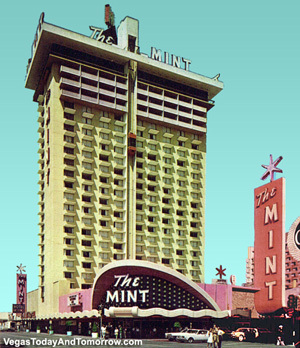 The street-front architecture was changed after Binion's bought The Mint in 1989. 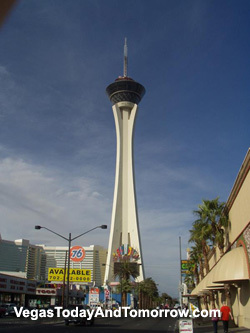 Originally, the Stratosphere was to be the tallest free-standing structure in the world at a planned 1,828 feet (nearly twice its current height). 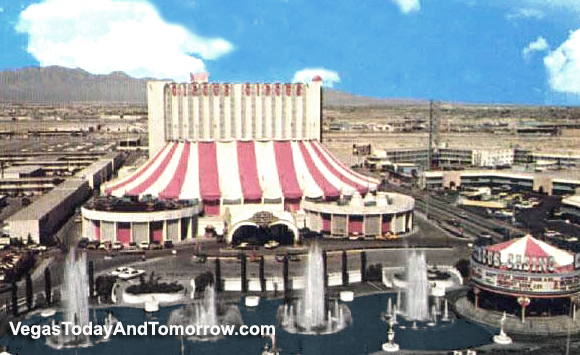 The tower was to be topped with a very tall spire, housing antenna equipment, a (yet higher) second observation deck and amusement rides. 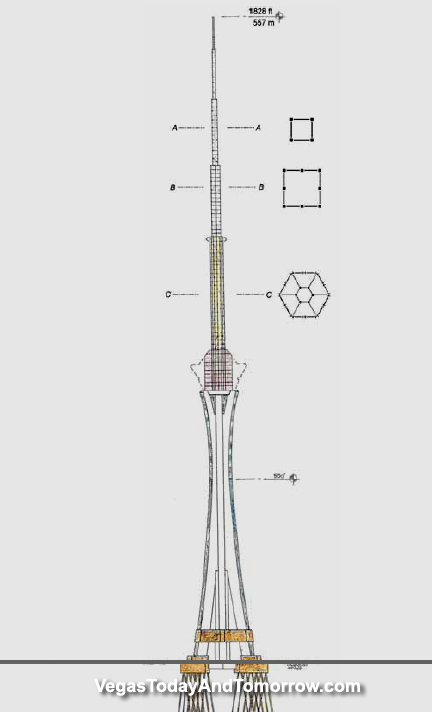 The FAA limited the height of the tower and the plans were changed. This is the 1997 model of the Augusta Tower at Caesars Palace, which was completed in August of 2005. 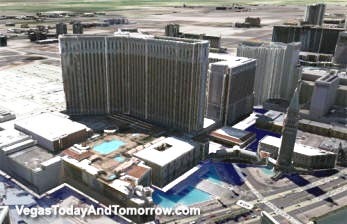 It is completely different than what was built. 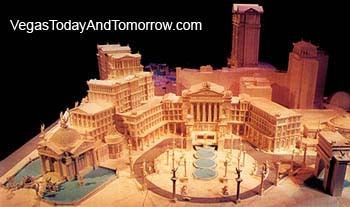 original plan. 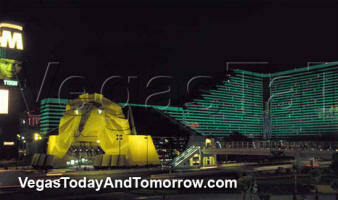 You can see more of the completed project here. 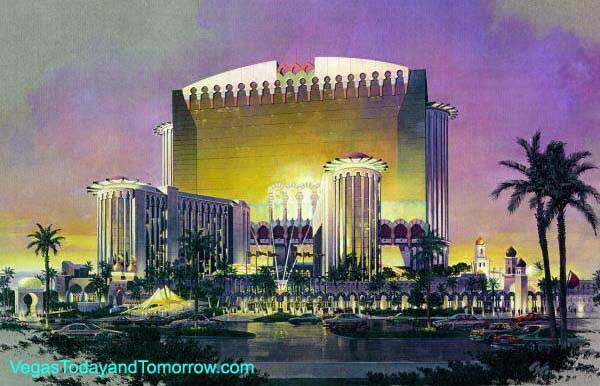 The original rendering of the Aladdin, in my opinion, is much nicer than what was built. 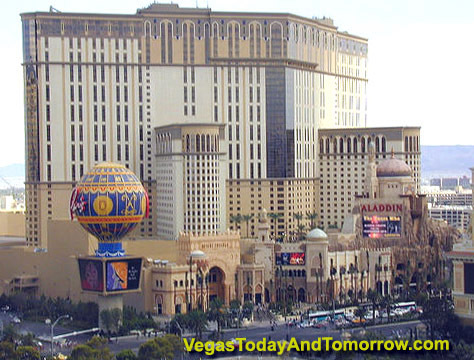 But then, the new owners, Planet Hollywood are going to change that, so it doesn't really matter. 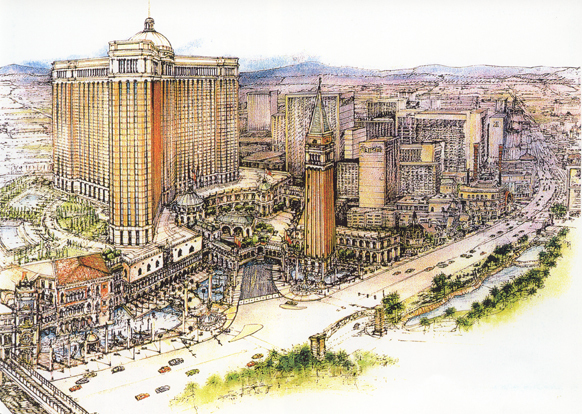 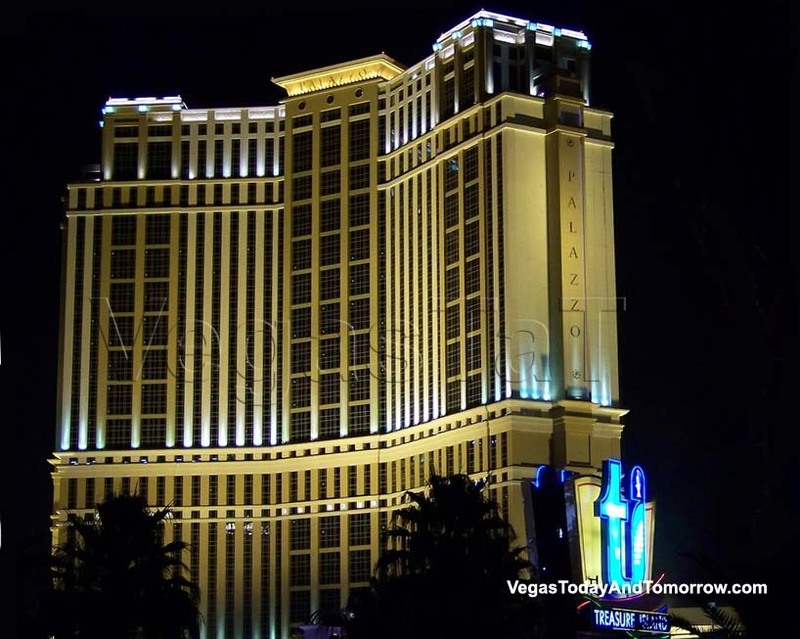 This is the first rendering of Palazzo at the Venetian. 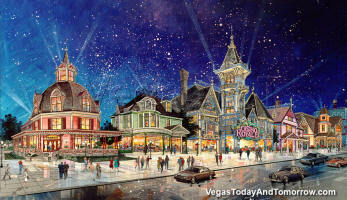 The original rendering (left) shows the rooms tower much closer to the Strip. 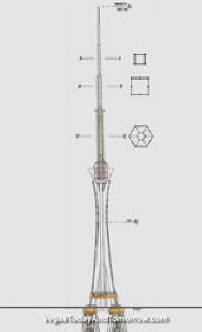 The tower also has a three spoke design (unlike the new design). 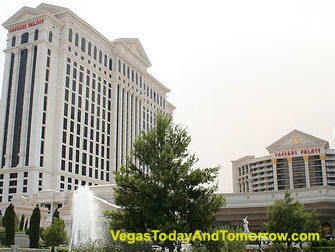 You can see the Palazzo being built and read more here. 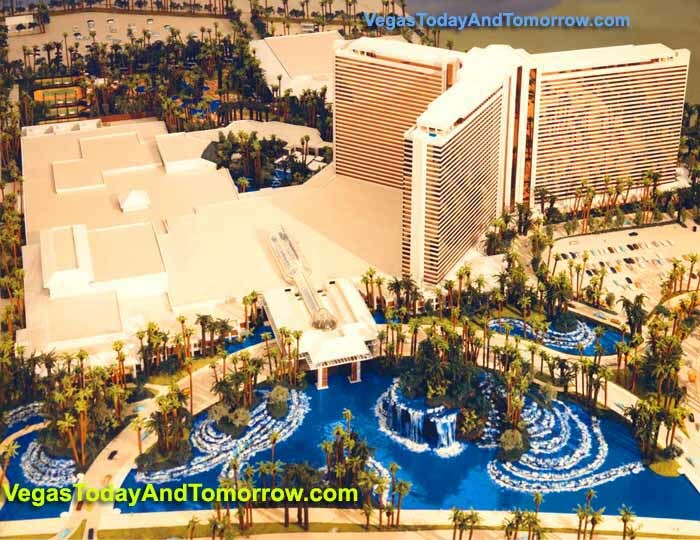 The original rendering of the Venetian is very close to the finished project. 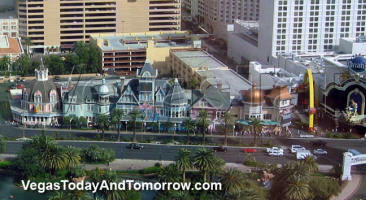 The main difference is the dome on top of the rooms tower (which never happened). 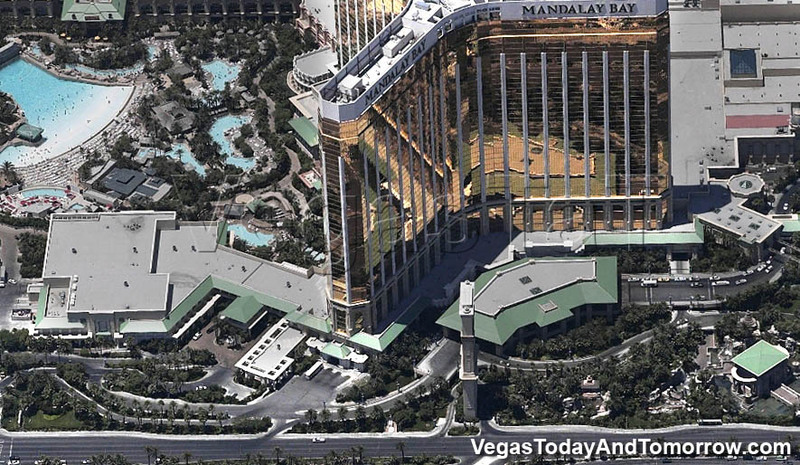 Other major differences are the orientation of the rooms tower (which was rotated about 60°) and the shape of the pool area. 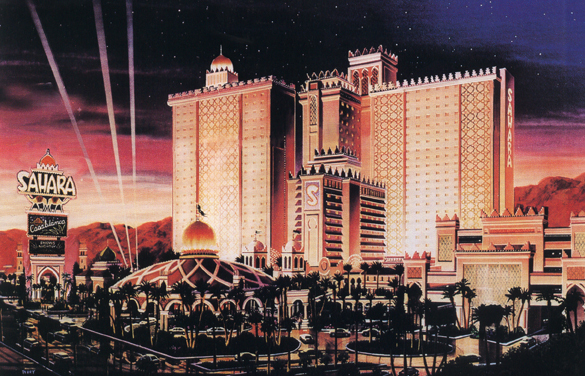 Although structurally similar to the 1999 remodel, this 1997 rendering of the Sahara, shows much more ornamental detail on top of the room towers. 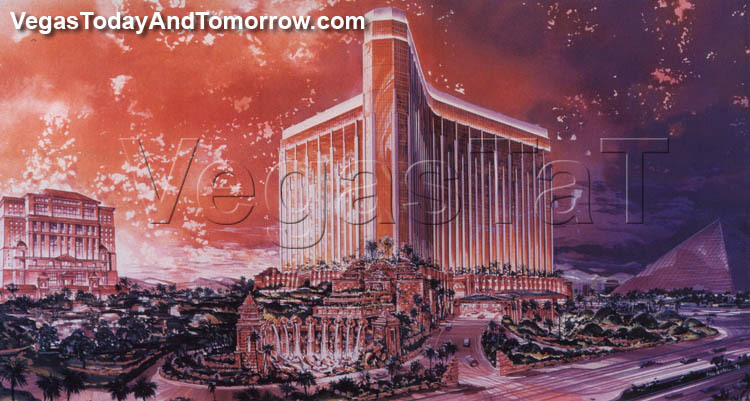 The original rendering of the Mirage, shows the hotel tower positioned to the far right (although it looks very similar to the tower that was built). 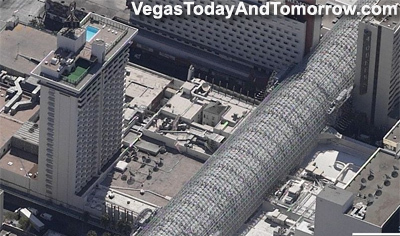 The atrium looks smaller and is more of a skylight. 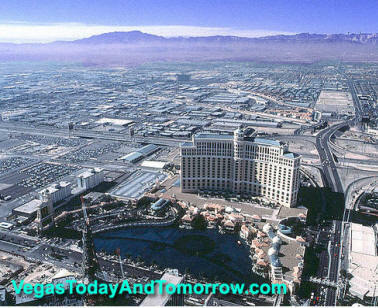 The lagoon looks to be a continuous body of water with the auto traffic using bridges. 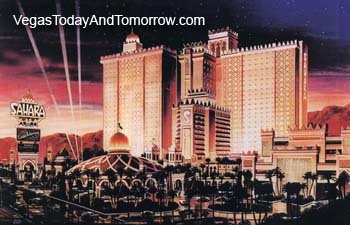 Steve Wynn's original concept for what became the Bellagio was a water themed resort called Beau Rivage.